Britain has come a long way over the years, but there is still a large proportion of the population that is still deferential to people who hold a position of prominence or responsibility. It's a real problem because all too often such people have low standards and are not honest or honourable. All too often they take advantage of the deference. 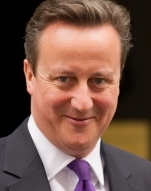 David Cameron is one such person. He is a serial liar. He is also an EU enthusiast and he's determined that Britain should be run by politicians and bureaucrats drawn from 27 other countries, people who have consistently outvoted the UK's representatives when they have opposed measures that do not serve this country's interests. To ensure that happens, Cameron has lied time and again. 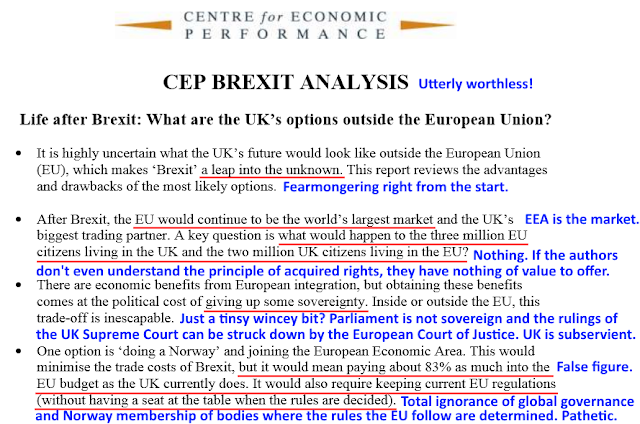 Most people are unaware that on more than 55 occasions Britain has objected to legislative and regulatory proposals generated by the European Commission, on the basis of them being unsuitable or harmful to Britain and her interests. However on every single occasion the British objection was rejected and the Commission has pressed on with remorseless determination. Despite this, Cameron claims Britain is influential in 'Europe' and will be stronger by staying in, even though changes that are coming will only serve to further dilute our voice in the EU and weaken the weight of our vote. Yet it's a fact that many voters will vote to remain in the EU because they trust what Cameron tells them. Make no mistake, that makes Cameron, not the EU, the real enemy of everyone who wishes Britain to be a self governing country with the capability and potential to become more democratic. During the referendum campaign it is plain common sense to focus attention on Cameron and expose his lies and distortions. If more people, who would otherwise vote to remain because Cameron says they should, lose confidence in him because of his dishonesty, it improves our chances of righting a historic wrong and giving Britain the opportunity to again be self governing and represent itself on the world stage using its own, undiluted voice. The media is all over the Boris backs Brexit story like a litter of excited puppies. Only that isn't what Boris Johnson is doing. He has said nothing about leaving the EU. Johnson said he advocates Vote Leave, but the furthest he went in his doorstep statement was to say he wanted to 'restore some control'. That is not the language of Brexit, that is the reform and remain mantra of Elliott, Cummings and Hannan. Johnson, like his friends in Vote Leave, isn't pushing for Britain to leave the EU. He sees a leave vote as nothing more than a bargaining chip to push for a better deal than the sham David Cameron brought back from the meeting of the EU Heads of Government. This is a shot in the arm for Vote Leave, but it does nothing for the campaign to achieve Brexit. Thankfully at least one journalist recognised the nuance and has called it correctly. The list of double-speaking Tories seeking to corrode the leave campaign has just grown a little bigger, nothing more. The fight to leave the EU hasn't become any easier today. The EU colleagues love their drama and they put on a show yesterday. They wanted people to think a huge and difficult victory has been painfully won by Britain at the expense of the other member states. Yet the length of Cameron's scripted speech made it clear the deal had been done some time before and there was no pain involved. A speech such as that needs reviewing, refining, re-testing, approval and a final check. That didn't happen in an hour or so. The Lithuanian President had already candidly told reporters that everyone would have their little drama then they would all agree. That's what happened. Even usually gullible journalists have finally come round to recognising the theatre of these contrived occasions and treating the fake drama with a measure of contempt. So, what does it all mean? I previously predicted with confidence that we would not have a June referendum, because there was no way the content of Cameron's deal could possibly be considered strong enough to put to the people. My argument was that this couldn't possibly be it. Cameron had stated in 2013 he was going to get fundamental reform of the European Union and he was going to change Britain's relationship with it. Yet the deal agreed yesterday doesn't come even close to the doing either. It's not even in the same solar system. But 23rd June has been confirmed now Cabinet ministers have fallen into line. That leaves me with egg on my face, but I will have to roll with it. The problem with my 2017 referendum prediction was the application of reason and logic to a process involving characters who happily lie, cheat and deceive in order to further their interests. The deal presented by Donald Tusk and still further watered down yesterday, was so lightweight and so trifling, reason dictated it could never pass for what Cameron said he would achieve. As such there would be no logic in going to the country and asking people to vote to remain in the EU on the strength of what would be put before us. But we are dealing with figures who will happily sell an entirely bogus prospectus of reform to an essentially decent, but ill informed and still largely deferential society because they see that enough people feel the politicians know about these things, are the experts and should be taken at their word. They are taking advantage. What caught me out was a failure to accept the capacity of the politicians to so brazenly tell people that black is white, despite the overwhelming body of evidence that tears their assertions to pieces. The problem is judging politicians by our own respectable standards is just inviting them to cynically deceive voters. That is what they are now doing. They are going to ignore the reams of evidence which show they are lying and are going to stick to the belief that if you tell a lie often enough, you will convince enough people to believe it and consent to the nefarious agenda. The Leave side has Vote Leave and the Leave.EU/GO Movement fusion. With other bloggers, we have exposed Vote Leave as leavers in name only as they have consistently advanced visions and ambitions that result in Britain remaining in the EU rather than leaving. Leave.EU at least wanted to genuinely leave the EU. But they have undermined any confidence we can have in them with juvenile attention seeking social media campaigns, unsubstantiated claims, misuse of figures and promotion of lunatic fringe narrative. Arron Banks then bankrolled Grassroots Out so it would come in behind Leave.EU's effort to win designation. But GO has been corrupted into a 'by politicians, for politicians' group, and last night saw many supporters walk out as George Galloway was introduced as its latest celebritician. It is beyond hope. This is awful for rational leave supporters. So, yes, I'm very downbeat. The EU is rolling on the floor with laughter at the way David Cameron prostrated himself before them to beg for a trivial deal that could be used to con British voters into thinking something had changed for the better, while declaring he would fight to keep Britain in the EU no matter what. The deal is like a balloon, cheap and filled with thin air. When popped, what is left behind is a shrivelled lump with barely any substance. The deal isn't legally binding regardless of Cameron's lies, as it can be reversed after the referendum. This is a confidence trick of greater magnitude than the 1975 referendum. So although I just feel like walking away, going fishing and letting everyone else get on with it, I want to fight against the lies and I want to fight for Britain to be free of the EU and its appalling objective of denying people democratic control while ensuring unelected decision makers cannot be held accountable for what they impose on us. I want the people of my country to be solely responsible for making the laws of my country and for governing my country. While there are some people in the main Leave groups that do not accept the roadmap I endorse for leaving the EU in a risk-free way, I will continue to promote it. Flexcit is the result of years of research, review, testing and validation by high ranking experts in governance and trade from a number of EU countries. It is plain common sense that you cannot unpick over 40 years of integration and centralised control overnight. While you leave the EU within two years of invoking Article 50, it will take time after that to rebuild our structures and capabilities, so we can engage in the world on equal terms. It is plain common sense that the current global rules on international trade cannot be broken by a newly independent Britain, which means that a leave plan needs to take account of the rules, what is possible and what the impacts of our trade status are once we leave the EU. Too many people don't realise the potential traps that await us after Brexit, so I will continue to make the rational, considered and evidence based case for Flexcit to be adopted in case people vote to leave the EU. The readership of this little blog has grown substantially in recent weeks. The number of followers of our low key Twitter account has risen by over 300 in the last couple of weeks alone. More people are reading and taking on board the rational arguments for Brexit, arguments that do not have immigration and xenophobia as their foundation, but rather the principle of democracy and perspective of self government. Thank you to all my readers and followers for making my tiny contribution worthwhile. I hope you will help spread the case for Brexit on your own sites and feeds, promoting the positive vision of an independent Britain returning to the global community with its own voice, cooperating with our neighbours, being influential in the world and thriving by seizing opportunities to increase the well-being and prosperity of our countrymen. Vote to leave the EU. While the Remain side attacks Daniel Hannan’s scattergun vision in his interview on Sky News this morning, there has been no reaction at all to Hannan’s extraordinary comments regarding his Brexit position, made earlier in the day on the BBC Radio 4 Today programme. Clearly, the Remain side are keen not to draw attention to the fact that Hannan isn’t a Leaver at all, but a Remainer who wants reform, not Brexit. Who could blame them? Each time this blog has explained Hannan’s contradictory position, that he does not want Brexit but would prefer to see Britain remain in a ‘reformed’ EU, we have been derided and abused by various people on Twitter who reject the assertion and evidence out of hand. So here is a little more for them. Maybe some of them will finally see the light. I mean I suppose it would be true to say that there is nothing that he can come up with today that would satisfy you. You want out whatever, don’t you? I mean I wanted out as a means to an end. I don’t know anyone who wants Brexit for the sake of it. We only see it as the means to the end of a more prosperous and freer and more democratic Britain. 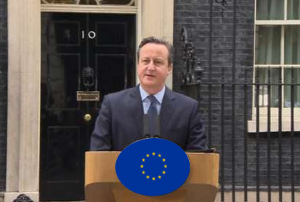 And I had hoped that that might have been something we could have done through an amicable renegotiation. Many people want Brexit for the sake of it, because the EU is anti-democratic and undermines our country’s place and voice in the world. Yet he claims to know none of them. Seriously? What Hannan is pushing is the Vote Leave agenda. Push for an out vote only as a means to an end, to leverage a different renegotiation that sees Britain remain in the EU. It is no different from the line the Vote Leave team had in their guise of Business for Britain, reform not Brexit. Perhaps now more people will realise that Hannan, and the company of which he is a director, Vote Leave Ltd, are pursuing a different agenda to those of us who want to leave the EU as a matter of democratic principle. They cannot be trusted, and when they talk about Brexit solutions they should not be listened to. 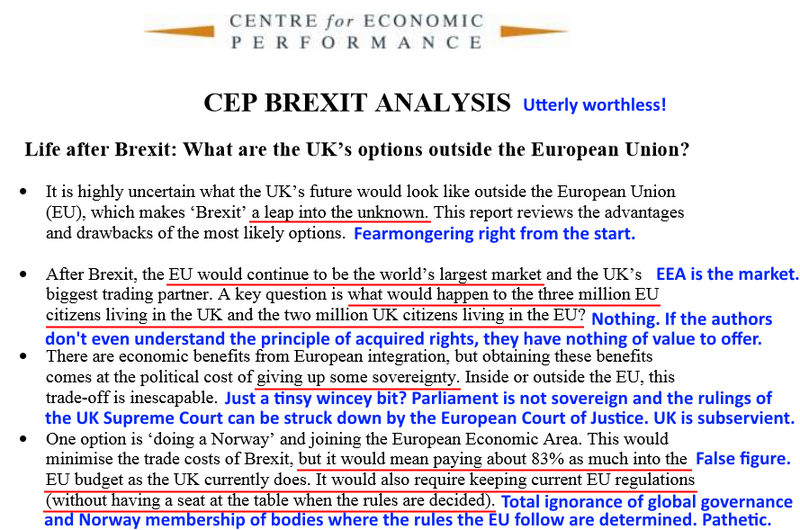 The unit has published a 14 page 'report', a CEP Brexit Analysis with the title, "Life after Brexit: What are the UK’s options outside the European Union?". Its authors are Dr Swati Dhingra and Dr Thomas Sampson (Edit: this author information has been amended to correctly reflect the preamble on the report and the LSE website). 1. Quite how a country having independence - something Britain did actually enjoy before the EU and most countries in the world still enjoy - is a 'leap into the unknown' is a mystery. But this is a stock EUrophile phrase to make people nervous of cutting the EU apron strings. 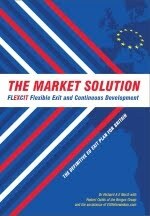 The FLEXCIT plan for leaving the EU and re-establishing Britain in the global community as an independent country, has as its first stage Britain rejoining the EEA and therefore maintaining market membership - not just access - until such time as a comprehensive trade agreement can be negotiated. Brexit is not a default departure from the EEA. There is a presumption in international law that when treaty rights have been executed, those rights are unaffected by withdrawal from the treaty (House of Commons, 2013). This suggests that individuals and businesses that have taken advantage of the Single Market to move either from the UK to the rest of the EU or in the opposite direction would probably be allowed to stay. But this outcome is not certain and would certainly be a subject addressed by any withdrawal agreement. There isn't any uncertainty at all. Articles 65 to 72 of the Vienna Convention on the Law of Treaties specify the procedures to be followed and the consequences of termination or suspension of a treaty. Article 70b of the convention states that the withdrawal from a treaty "does not affect any right, obligation or legal situation of the parties created through the execution of the treaty prior to its termination". So there is no suggestion that such people would 'probably' be allowed to stay where they are. Their status is guaranteed as a result of, in the words of Lord McNair, the "well-recognised principle of respect for acquired [vested] rights". The only possible reason for Dhingra and Sampson's uncertainty in this area is either a lack of understanding, or a deliberate attempt to create needless fears and doubts in people. Acquired rights are regarded as a fundamental principle of international law, or a customary law if you will, which even non signatories accept. comes at the political cost of giving up some sovereignty". Presumably there aren't any economic benefits from independence and control of our country's trade policy and ability to negotiate our own agreements. The issue here is that far from giving up some sovereignty, Britain's EU membership has relegated our nation state to the status of province of the EU supranational entity. When an EU member state's parliament is unable to legislate as it sees fit in areas that the EU has taken control of, and that nation's supreme court's rulings can be struck down by the ECJ, then what has been given up is not 'some sovereignty' but substantive control of the country. There are not many areas where the EU does not direct or limit our actions. Playing this down is a tool of the EUrophiles, deployed to underplay the sheer depth of this country's subservience to the EU. The downside of EEA membership is that non-EU members of the regional trading arrangement still need to implement and abide around 20% of laws, which are there to service the operation of the single market, such as the free movement of goods, persons, services and capital. They also need to maintain a commitment to regulatory convergence and implement common enforcement systems. But it is still far better than anything any EU member state enjoys. Another plus side is that a non-EU member of the EEA does not have to apply common tariffs and can also negotiate and agree its own trade agreements. This immediately provides additional scope and flexibility for British exporters, and the prospect of other British businesses of exporting to currently untapped markets on favourable terms where the EU has no deal. But what of Dhingra and Sampson's claim that Brexit "would mean paying about 83% as much into the EU budget as the UK currently does"? It simply isn't true. That figure can only be arrived at by including grants and payments Norway makes that are not remitted to the EU budget, such as the money it channels to former communist states to aid their economic rehabilitation. According to the Norwegian government's own figures, its total EU mandated payments (gross) are approximately £435m (€600m) per annum. With a population of five million, that is approximately £86 (€120) per head (gross). Net payments, however, are about £340m (€470m) per annum, or about (€94) £68 per head per annum. On the other hand, in 2014, the UK gross contributions to the EU were £19.2bn, less £4.9bn rebate. That gives an equivalent gross payment of £14.3bn. After receipts, our net contribution was £9.8bn. With a population of 64 million, that puts our gross contribution (without rebate) at £300 per head, our equivalent gross payment at £223 per head, and our net per capita payment £153 per head per annum – more than twice the Norwegian payments. 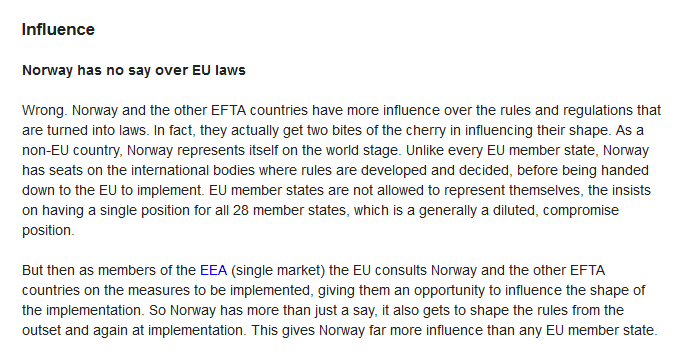 It is also worth noting that the amount Norway paid in total to EFTA (which includes the cost of EEA administration and operation fees) in 2014 was 12 million Swiss Francs or around £8.4 million pounds.This means Norway paid something less than £8 million for inclusion in the single market, approximately £1.60 per head per annum. This work is staggeringly poor. We should respect people taking a pro-EU view. But they should be honest about it and use facts, not falsehoods. 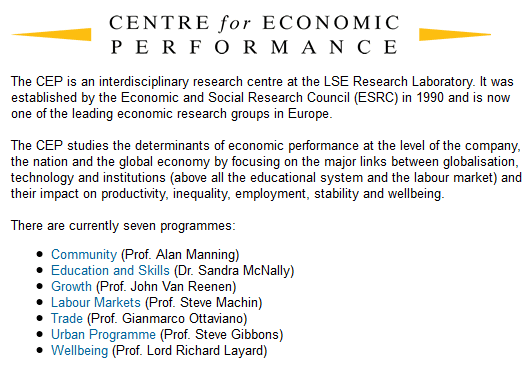 Frankly the LSE should be ashamed of the lack of integrity and academic rigour on show from its faculty. It demeans the college. With sincere apologies for the delay in delivering this... lots happening away from the blog. Anyone trying to argue that Britain can remain in the EU and that Parliament can be sovereign, or that a new Constitutional Court can bat away EU laws, would be lying. I'm not saying they would be exaggerating or overstating the position. I'm saying it is not true. At all. It is inconceivable that Cameron doesn't know what he claims to want to 'put beyond doubt', namely that the UK Parliament is sovereign, is not possible if Britain remains a member of the EU. The treaties we have signed gave away Parliamentary sovereignty to the EU and gave the European Court of Justice the power to make rulings that we must obey absolutely. To sum up then, in part 1 we have made the case that Cameron's EU-UK deal, currently being theatrically hawked around the member states by Donald Tusk for their approval, is an empty, meaningless sham that gives no power back to Britain. And in part 2 we have established that Cameron's promise to bolster it with some kind of Parliamentary sovereignty act and a Constitutional Court is a cruel and cynical deception. So what do we think Cameron's game really is? Answer: We believe Cameron is treading water and playing for time, in the hope that the EU re-focuses its attention on plans for a two tier EU - creating a status known as Associate or Affiliate Membership - and begins to firm up proposals for the necessary treaty that enables the Eurozone countries to press ahead with integration in support of their common currency. Such a treaty is to be designed in a way that prevents the non Eurozone countries from holding back that integration. For Cameron, it also provides the happy benefit of giving the impression the UK will be going no further down the path to ever closer union. It would give him the opportunity to declare he has won a massive victory and opted Britain out of more integration. But as Associate Membership is about the future needs of the Eurozone members, it is extremely unlikely it will do anything to row back what the EU has already imposed on us. 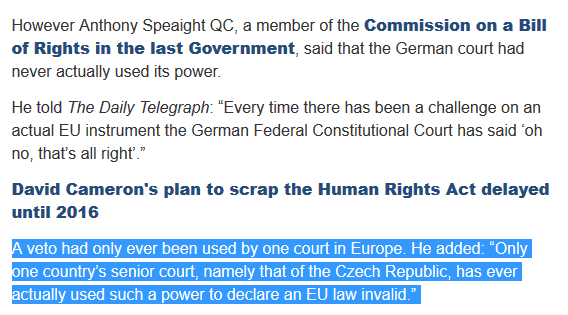 It won't return substantive powers and it won't remove us from the jurisdiction of the ECJ. Associate Membership is current EU membership, without needing to accept the additional economic integration needed by the Eurozone countries. 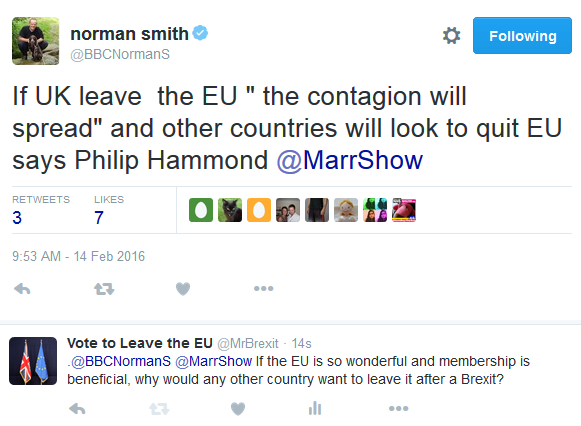 It is a Remain proposition. It changes nothing for Britain. Since before the Five Presidents' Report, the need for a form of Associate Membership (AM) has been acknowledged and accepted. We've mentioned it on this blog before while highlighting the people who are supposedly eurosceptic, but hanker after it. 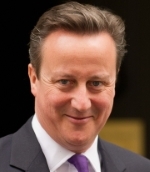 The problem for Cameron is that he had hoped he could point to AM in time for the referendum. But there hasn't been sufficient progress, so he is trying to play for time until there is something more substantive to declare as a major reform. As Cameron has pledged to hold the referendum by the end of next year time is running out. The EU knows AM is a pressing need, but it is very patient in its approach and its timeline won't take account of what Cameron wants. That's why we have seen the sham deal and the naked deception of Parliamentary sovereignty come to the fore as disposable placeholders. Associate Membership will come. It's just a matter of time and the EU has plenty of that. 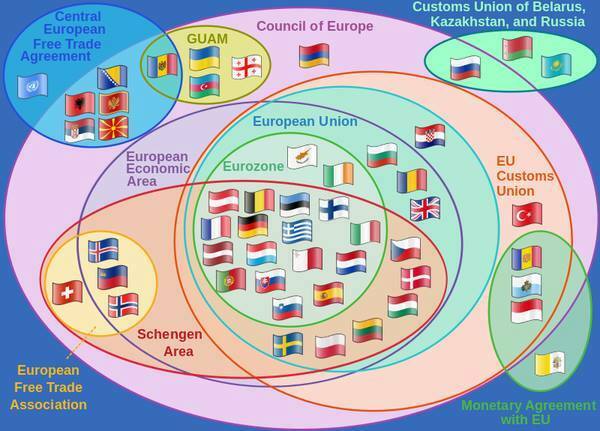 It's taken over 40 years to get the member states as integrated as they are. Hell, it's taken more than two years just to get some kind of imaginary concession about Britain being able to adjust in-work benefits for migrants, even though the provision already existed in the EEA agreement as an existing safeguard measure set out in Articles 112-3. The EU is in no big rush. Cameron is out on a limb, with only the inherent advantage of status quo and voter ignorance in his favour when it comes to a vote. Even if he holds and wins 'his' referendum in 2017, this all adds up to a badly mismanaged piece of politics by Cameron. 2013 saw him panic because of a combination of large Labour poll lead and consistent rump of support for Ukip, leading to his Bloomberg speech. Promises spilled forth in quantity, but just about everything has been quietly dropped from his list, leaving a trivial basket of 'demands', most of which could already be implemented as they are catered for in the existing treaties. Cameron's attempts to bully and silence members of the government who believe in Brexit have been typically arrogant and ham fisted. The lies he has told the public so far have been disgraceful, and those that haven't already been pulled to pieces will be exposed over time, undermining trust in the Conservatives. The waste of time and money pushing legislation that cannot assert primacy over the EU, and the vast expense of his constitutional white elephant which will be unable to overturn decisions from the ECJ, will be recognised as such and there will be a reckoning with the voters. My promised second prediction is that once the referendum is out of the way, the men in grey suits at Conservative Central Office and the wealthy influencers behind the scenes we never see or hear about, will pull the plug on Cameron. I expect that he will step down before the end of his second term and a new leader will become Prime Minister and lead the party into the next election. Who might that be? Well, my money is on someone who has shown themselves to be ruthless and ambitious in equal measure. Someone who has quietly assumed high office without fuss and is rarely considered as a heavyweight. A man who has backed Cameron loyally, lied relentlessly in the pursuit of putting the party before all else, and who possesses a smooth, oily arrogance and has the look and tone of voice that always seems to win over the party. Someone will enough smarts to see off George Osborne. That man is Philip Hammond. Watch ascent unfold. In part 1 we set out our prediction that there won't be a referendum in June. It examined the sham renegotiation and the 'deal' that only pretends to deliver reform. The deal adds hardly anything to powers that countries already have under the existing treaties. It's so poor, so lacking in substance and so transparently meaningless, it could never be the basis for a referendum vote. It seems to be either a delaying tactic designed to kill time, or the warm up act for something very different to be presented. This post focuses on second of those two possibilities, that the renegotiation and deal was just a warm up act for another performance. Dismissing the renegotiation deal, what could Cameron put in front of the country that would see him claim that we will have a fundamental change in our relationship with the EU? In short, the notion of Parliamentary sovereignty and creation of a new British Constitutional Court. The prime minister, who is keen for Johnson’s support in campaigning to keep Britain in the EU, gave a highly detailed response. He said that he would “put beyond doubt” that the Commons is sovereign, adding: “That is something I am keen to do even more on – to put beyond doubt that this house is sovereign. That is something we will look to do at the same time as concluding these negotiations. To underpin the supremacy of Parliament that Cameron envisages, he has instructed Michael Gove to bring forward plans for the creation of a Constitutional Court similar to that in Germany. 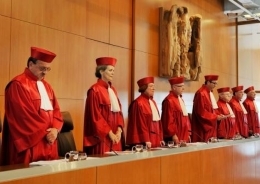 The German court was established in 1951 with powers to strike down legislation that is incompatible with its constitution. Parliament having precedence over the EU and backed by a Constitutional Court to overrule EU laws would certainly be a fundamental change. It would be red meat for those who want to see Britain in charge of its own affairs. No doubt it would be a referendum vote winner. But it is also pie in the sky. With this in mind it is instructive to look at the coverage of this in the media. Instead of taking the opportunity to squash the self evident nonsense of Cameron's false claims, and highlight the waste in time and public resources of having a talking shop that cannot effect any change, the media has allowed partial information to go unchallenged. A case in point is the Telegraph. This passage is interesting for what isn't said. For example, the reason the German court has never used its power is because it knows it doesn't have the power to stop EU laws being handed down and implemented in Germany. The court recognises that EU law has primacy and if it were to declare an EU law unconstitutional the European Court of Justice (ECJ) would use its legal primacy to overrule the Germans. That's what a country accepts as part of EU membership. There is no way around it. There was no veto of EU law at all! 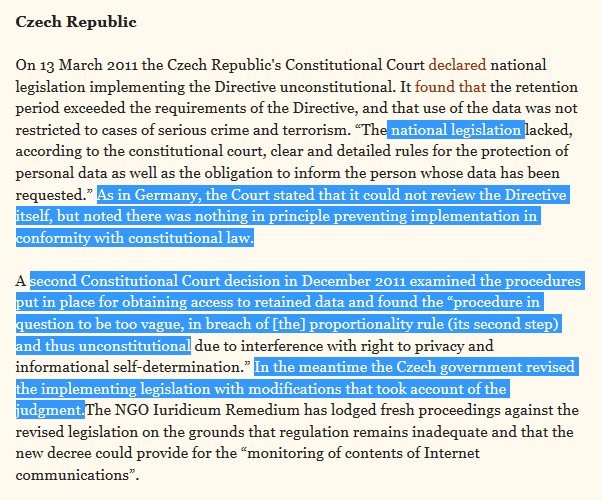 Instead the Czech court had stepped in to declare the national legislation written by the Czech government to implement the Directive as unconstitutional. 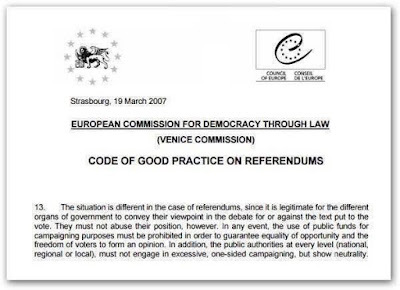 Additionally, the piece shows the Germans also recognised the EU Directive could not be reviewed. The outcome was the Czech government revised its own legislation to ensure it was constitutional, and it implemented the Directive unmolested. Telegraph readers would not know this, as they have been left thinking that a veto of EU law is possible, when in reality it isn't. The arguments for and against are the same as for Trident – there is a value in a nuclear deterrent because it might deter EU institutions from overstepping the mark. To exercise such a power puts the state involved in conflict with its international obligations under the EU treaties to give effect to all EU law. It should be noted that even though Michael Gove has been tasked with setting up this Constitutional Court, even he has carefully couched his language to only give the impression of primacy when in reality it will be powerless. "have capacity to say that in certain areas EU law ran counter to certain British freedoms." The court, be it a wholly new creation or part of the existing Supreme Court could say anything it likes. But it won't be able to change a thing, regardless of what Parliament wants. EU member states have given up that ability to run their own countries. It would be a waste of time, effort and a huge waste of salaries and operating costs paid for from our tax pounds. So, could the sham renegotiation deal be the warm up act for this? Could David Cameron be preparing to sweep aside his 'hard won' deal in favour of this new illusion? Cameron's thinking could be that too few people will understand the distinctions and therefore vote to remain in the EU on the basis of this empty rhetoric that Britain is somehow taking back control. But it seems implausible that Cameron would be able to get away with such a blatant lie. Britain cannot unilaterally rewrite the rules on EU membership to ignore EU laws and ignore the judgements of the highest court of our country's legal system, the ECJ. The only way such power could rest in British hands is if we were to leave the European Union. That isn't on Cameron's agenda. Perhaps then this notion of Parliamentary sovereignty and a Constitutional Court, which could never deliver what Cameron is claiming, is merely a red herring or another delaying tactic. It could never stand up to even the most basic of scrutiny and would likely destroy Cameron's Prime Ministership into the bargain, seeing him forced out and replaced before his planned resignation date ahead of the next election. That leaves one final possibility and the one I consider the most likely to be played out. It is still something that could see Cameron replaced by Tory MPs. Part 3 will look at what appears to be coming down the line, the most realistic referendum timing, and my prediction for Cameron's successor. I'll put my neck on the block and offer a couple of predictions in this short series of posts. The first prediction is that there will not be a referendum until 2017. It certainly won't be in June this year. Realistically the December European Council is going to represent the start of the serious and multi-lateral negotiations around the British package. That meeting was on 17-18 December. The conclusions of the Council were published and showed exactly this much information regarding discussion about the British referendum and 'satisfactory solutions' to British demands. That was it Christmas and New Year followed. Then apparently so did the commencement of David Cameron's much vaunted and long trailed reform extravaganza, the 'fundamental renegotiation of Britain's membership of the European Union'. So fundamental and far reaching were the reforms, the discussion was concluded in less than one calendar month. 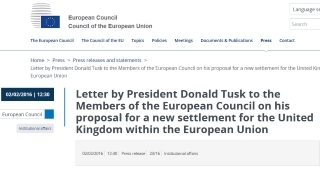 Donald Tusk published a draft agreement for consideration by the member states, on 2 February. 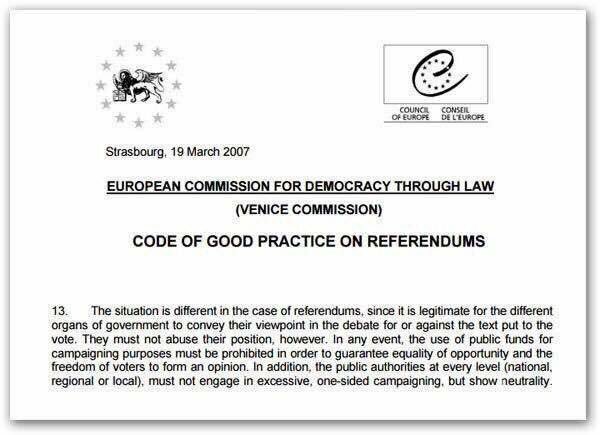 It was quickly apparent that the EU had done what it has done before. It had seen to it, with Cameron's connivance, that none of his 'four baskets' contained anything that amounted to new opt-outs; none made any substantive change to the treaties as agreed; and all were crafted, with a mixture of high politics and low cunning. If some of the words seem familiar, that's because they were borrowed from Andrew Duff when describing the EU's previous deceptions to make voters think their countries had secured changes or concessions after they opposed treaties. Borrowing in part from Duff again, this time as before, the terms of the draft agreement are mainly of a tautological or oxymoronic nature – affirming that the treaties mean in fact what they say – although some take the form of promised future additions to treaty texts. There is nothing of any substance that is new. In-work benefits for migrants will continue to be paid, beginning at a reduced level and rising until after four years they match the level paid to British nationals. Big deal. That only impacts 1.4% of the total in-work benefits budget. It's meaningless. As for the supposed 'Red Card', that is nothing of the sort. It has been presented to make it look as if Britain can block EU laws taking effect. We can't. It only applies to the principle of subsidiarity, an principle whereby the EU does not take action (except in the areas that fall within its exclusive competence), unless it is more effective than action taken at national, regional or local level. It does nothing to provide any block to EU laws. Directives cannot be rejected. Blocking such EU subsidiarity action required 16 members of the European Council to oppose it. Cameron's big deal means it will need 16 national parliaments to oppose it, which actually increases the size of the hurdle that must be jumped. Huge reform, that. Not. All this is a long winded way of making the point that the deal Cameron has agreed with the Council is empty. There's no way he can put it before the country and ask them to decide Britain's future on such a basis. It's meaningless. Hardly anything has changed. Cameron has asked permission to ask permission to undertake actions that are already covered in the treaties. It's not even tinkering around the edges, it's an underlining of the status quo. What has been presented is so completely devoid of any substance, it doesn't come remotely close to what Cameron promised to achieve in his 2013 Bloomberg speech - which set out the scope of reform upon which voters were to decide whether to leave or remain. The so called renegotiation has been so tainted by the farcial deal and the smoke and mirror presentation of it, particularly from the silk smooth accomplished liar, Philip Hammond, that only a complete moron would dare put it before voters. Putting it to a vote at all, let alone in June, would mean a leave vote. So a period of time has to elapse now, to let the media blow off steam and voters to forget the terms of the deal and why it has been so ridiculed. That means no June referendum. But that also means there has to be something else. This 'deal' isn't the main event. It is merely a distraction, or a filler to kill time for something very different that removes the current deal from consciousness. What could that very different thing be? In the follow up parts 2 and 3 we will examine the scam named in the title, which is Cameron's latest wheeze, and my second prediction will be revealed.